Joy Creek Photo Archive (c) all rights reserved We grew this many years ago and lost it in a cold winter. We thank Shirley Lock for restoring it to our gardens. The bold foliage is extraordinarily colorful with its green and cream variegation and cerise veining. Red petioles only serve to accent the scarlet flowers with their purple corollas. 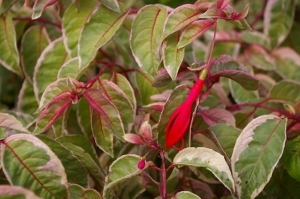 Trailing in habit, Fuchsia 'Tom West' can be used successfully in hanging baskets or to light up a sheltered corner of the garden. Summer to autumn. 12-24 in. x 12-24 in.